Sound familiar? The last time you got angry, what did you do? Did you start shouting, or even swearing? This is actually mentioned as a sign of weak emaan by the scholars! 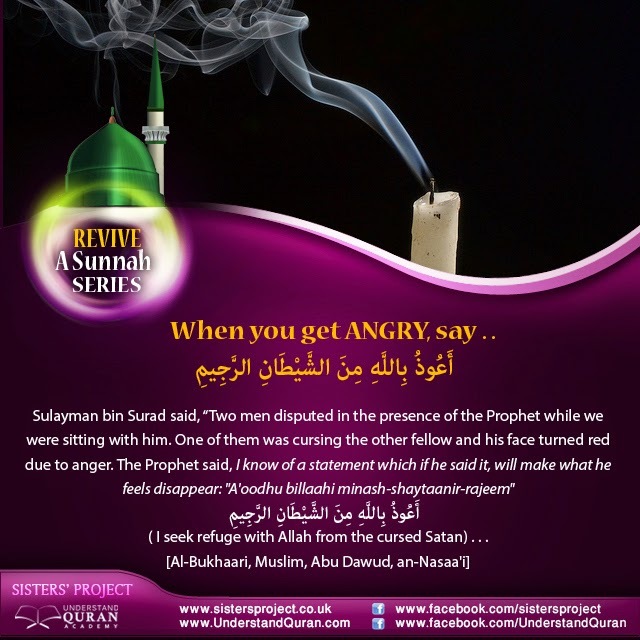 Getting angry happens, but turn it around and try to build this rewarding sunnah habit: seeking refuge in Allah. So don’t only say ista’adhah (seeking refuge) when you start praying or when you read the Quran; use it as a weapon against your own temper! The next time you get angry, before doing or saying anything else, say ‘a’oodhu billaahi minash-shaytaanir rajeem! Stick a note on the wall with the ista’adhah on it to remind yourself throughout the day. Teach the children by example (and all your family & friends)!